Skill and accomplishment are at the forefront of this unusual work. But instead of technique with a brush or a chisel, we are treated to the novel and maybe useless vocal imitation of 32 typewriters. This is representational art of the highest order. Each sequence of hammer strikes does sound, it must be said, just like a typewriter and a different one each time. With no immediate sources to refer to, the performance is taken on trust. As with Mona Lisa or Dora Maar, there is little point in questioning resemblances. But while Da Vinci or Picasso went all out to capture beauty or its opposite, Ignacio Uriarte has gone in for precise realism in an area which, unlike a model or a landscape, has marginal interest. The 21 minute film, in which we hear the same phrase typed over and over, is mono-manic. But that 56-character phrase, The History of the Typewriter Recited by Michael Winslow, is also the title of the film. So in a sense, the sounds you hear refer to nothing more than the sounds you hear. The virtuoso performance with all of its mimetic skill is little more than a sideshow. It is fitting that Winslow is a comic actor and he cannot resist a good many gestural asides throughout the film. Be dazzled by all means, but rather by the force of its creation. not the means of its execution. Three locations are evoked by the film Deep and Meaningful by Oliver Beer: the sewer in which the original choral performance was filmed; the type of church where you might expect to hear such a thing; and the gallery environment in which it might end up. 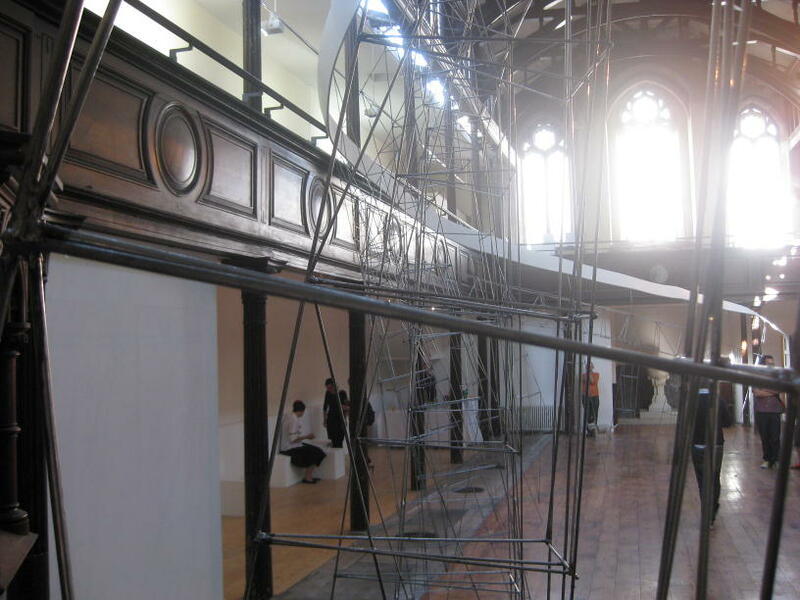 The correspondence between church and art gallery is self-evident. To many both are sacred spaces. Both offer a place to reflect. Visitors to either may hope for revelations or the appearance of truths. But the links between church and sewer are less clear. There could be straightforward blasphemy in the work. Or perhaps it is that both perform perform civilising roles and both absolve the user. Finally this piece brings the sewer into the gallery. In a more polite way, it is a similar gesture to that of Duchamp and his urinal. It could suggest art is a functional and dirty business. Seven well-trained voices join in harmony for the performance. Their song is pitched to vibrate with the sewer and echo around the gallery. It elevates the former, and raises questions in the latter. The church is conspicuous by its absence. ‘Amen’ is sung without an obvious referent. It could be affirming Victorian architecture or possibly contemporary art. But you can find religion in both. 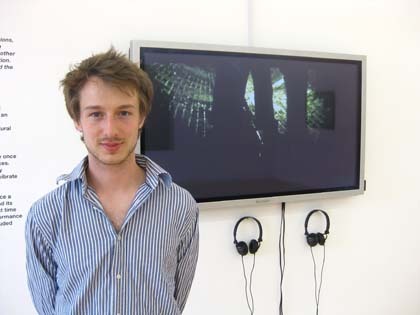 Oliver Beer, Deep and Meaningful, is currently on show upstairs at 20 Hoxton Square Projects until 24 July 2010. This blog entry is being put together to the sound of The Fall, in an attempt to understand why so many artists claim, or are said, to draw or paint to the sound of Mark E Smith’s timeless band. Usual conditions for producing these musings are, for the record, a joyless silence. There seems to be a need to isolate thoughts in order to put words down on a page or screen, for me at least. But apparently, not so for artists, and at least three reasons suggest themselves for choosing The Fall over the many thousands of competing soundtracks: lyrics, rhythm and modus operandi. Smith says in the Tate film (above) that his lyrics are open ended, but the reverse should be argued. Fall songs are packed with concrete nouns, names and places. Things get nailed down and perhaps visual artists relate to that. However, the band’s krautrock(abilly) rhythms can easily be understood to help with long periods in the studio. The Fall lay down some of the busiest grooves in rock. One imagines that disciplined, purposeful lines and brushstrokes are the result. The other apparent reason to paint to The Fall is their anti-muso stance. As Smith says, he tells musicians what to do and constructs the tracks like an engineer. Who wouldn’t want to work with pictorial elements in the way he works with instruments? So there you have it, the wide appeal to artists of a unique band, as written while listening to the music itself. I’m sure it could have been finished in half the time without this racket, brilliant though it may be. Your Future, Our Clutter by The Fall is out now on Domino Records. Tabaimo’s animations are without doubt unsettling. But the more you watch yudangami (2009) the more you want to watch and the same can be said for her entire show at Parasol Unit. It would be rational to look away, but the films deal in revealing the hidden. No wonder they are compelling. In yudangami the hair becomes a living curtain which is parted, glimpse by glimpse, to allow us to witness scenes of increasing strangeness. Disembodied hands caress this screen, building the sense of tension and of promise. They may belong to us. They may belong to the artist. Either way we are involved. By the end we have taken part in a mystery with no obvious cause, meaning or solution. Tabaimo has enshrouded us. We succumb to the fascination of what unfolds as if to death. So the film’s very watch-ability is a problem. But not a problem for the artist. She demonstrates that art can transport its subjects to the very edge of consciousness, or to the other side of human knowledge. You do not have to wonder why people make art when it appears to offer its users such powers. Of all the millions killed in WWII, the fate of a fictional character has concerned me more than any. Stranger still, I have found myself rooting for a German and a high ranking SS officer at that. The same might be said for you, if you’ve read the Kindly Ones, a book which turns preconceptions about the Second World War on their head. Max Aue is one of those educated, cultivated Nazis you often hear about. He has a doctorate in law. He loves French classical music and wishes he could play the piano. Towards the jews, he harbours no personal hatred. But all the same, from an ideological perspective, he believes in enslaving them and co-operates in massacres at the front and the institutionalised murder of the camps. But early on this bloody-handed narrator insists that the men who pull the triggers are no more culpable than, say, men working in gun factories or even the builders of roads. You, dear reader, would have done the same, says he, and this dispassionate, involving epic soon fosters a certain level of collusion with Aue. His guilt soaks into you. The Obersturmbahnführer’s crimes go back to the nursery and later return to the family home with devastating effects, or so it seems. Only the horror that surrounds this character offers any sort of expiation at all. Where civilisation breaks down almost everyone is as bad, or worse. The book is full of shocking, unfilmable details which cannot but be true. Despite all this or perhaps because of it, The Kindly Ones is filled with excitement. Aue is a great escapologist, surviving Stalingrad, near capture behind Russian lines and a final apocalypse set in Berlin. There are meetings with Eichmann, Speer, Himmler and even Hitler. His involvement with the 20th century’s greatest conflict is total. Jonathan Littell has demystified the German regime and taken the romantic sheen off what has been called the last just war. His book left me with great sadness and no little amazement. Perhaps all art has ever done is provide visual enjoyment, depsite the questionable values inherent in traditional, modern or contemporary subject matter. Fiona Banner’s latest commission at Tate Britain is indeed problematic, but without question it is still enjoyable. 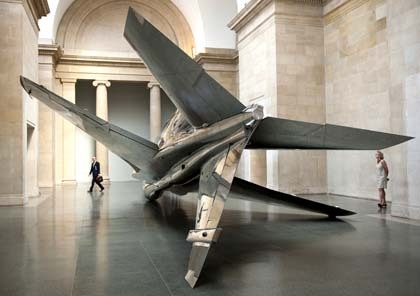 The London-based artist has installed two decommissioned fighter planes in the neoclassical Duveens Gallery. One, upside down, has been stripped of paint and now has a mirror-like finish. The other hangs from its tail fin and has been painted with feathers. Some will complain you can get a comparable thrill at an air show, which may be true. Does that mean Banner’s work is not art at all, or could it mean that art can be found at air shows, or even at arms fairs, should they stimulate the sight in a pleasurable way? So given the wider picture, art does more than give pleasure. It also offers the chance to reflect upon the experience. That may be the greatest thrill of all.